Just put "sign me up" or something similar in the subgect line. Gardening questions are welcome also. Unlike many other businesses that hire outside firms to maintian their internet presence our newsletter, email list, and website are handled by one guy, me, Al Funke. With over 30 years in the industry and a degree in the field (OSU college of agriculture class of '83) I continue to make sure that you get truthful and accurate information so that your garden projects get done right the first time, every time. Conveniently located just minutes from I-75 & mitchell ave. see map for directions. Scroll on down and have a look! 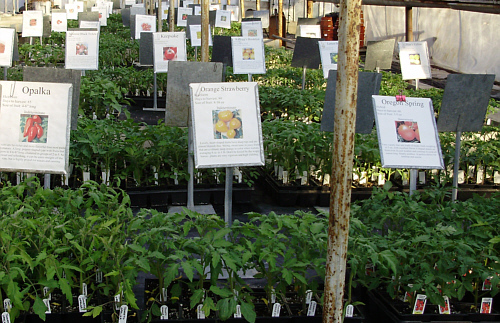 Don't forget our insane selection of heirloom tomato plants priced at just $1.79 ea! Come see why people are driving from 50 miles away to shop Funke's. Great plants, great service, great prices, real value. Get future updates and great garden info ahead of the crowd by signing up for email garden newsletter. Just good stuff :) No spam ever :) All addresses kept confidential. Other greenhouses charge up to $35 membership fees for what we give you for free! Just click the link and say sign me up! Professional installation available June - November see the landscape page for a sample of our work.